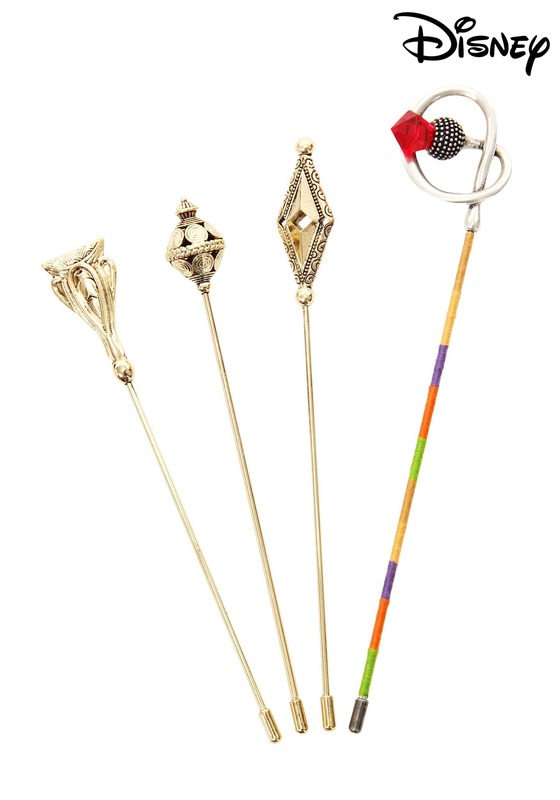 Pins range in length from 6" to 7.5"
When you're a hatter who likes to travel around through Wonderland quite a bit, you're going to want to bring everything you need for making hats along with you. The Mad Hatter has a pocket with scissors, a bobbin ring with a few small pins, a bandoleer full of bobbins, and tons of ribbons. It can be a tough job! He's even willing to sell the hat on his own head! You ever wonder what those numbers meant? It's an old way to show its price; it means six pounds, ten shillings. He even has a few of his fancy pins stuck in his hat! These favorites are probably a little more for decoration than function for our friend, but then again his middle name is "Mad" (well, it is when you call him "The Mad Hatter"). With these four pins officially licensed and looking this terrific, you know it's the only way to complete the most authentic looking costume imaginable for your next party. Once you've got it all together, you'll have to get in the mind of the Hatter, because we really want to know why a raven is like a writing desk.